Please prepare yourself. I’m going to blow your mind: we at the library love to read. We read everything from fiction to biographies to cookbooks and history. So it should really come as no surprise that we love to talk about books just as much, if not more, than actually reading them. Occasionally we’ll have a staff meeting focused solely on discussing one type of book. What did we like? What did we not like so much? What’s popular in our community? This past week we discussed self-help books. In addition to facilitating our discussion, Marge prepared a list of 50 authors to know in the self-help world. She also shared an article by Daniel Lefferts with an overview of the top self-help books to take into 2013. In preparation for this discussion we were asked to think about what self-help books we’d recommend to others. Turns out I don’t really read many of them now, although according to GoodReads I have rated a lot of them in the past. I wondered why this might be. What do I do, in my 30s, that I didn’t in my 20s when I read all those self-help books? The answer slowly appeared, as if from a magic 8 ball: I’m way into stand-up comedy. That’s right: I worship at the altar of hilarity, where the main dogma is, “Laughter is the best medicine.” Feeling down? Try a stand-up routine! I guarantee it won’t solve the underlying problem you’re currently moping over, but it will lift your spirits and maybe even give you the confidence to face your problem head-on. My husband, Chris, and I decided this would be the year we’d go out and see some of our favorite comedians up-close and personal. Would the real-life experience stack up to the edited versions we’d heard on CDs, podcasts, and on TV? Turns out that, like most fascinating things you see on TV, the reality is just bigger and more satisfying in person. Our favorite show so far this year has been finally getting to see Jim Gaffigan. 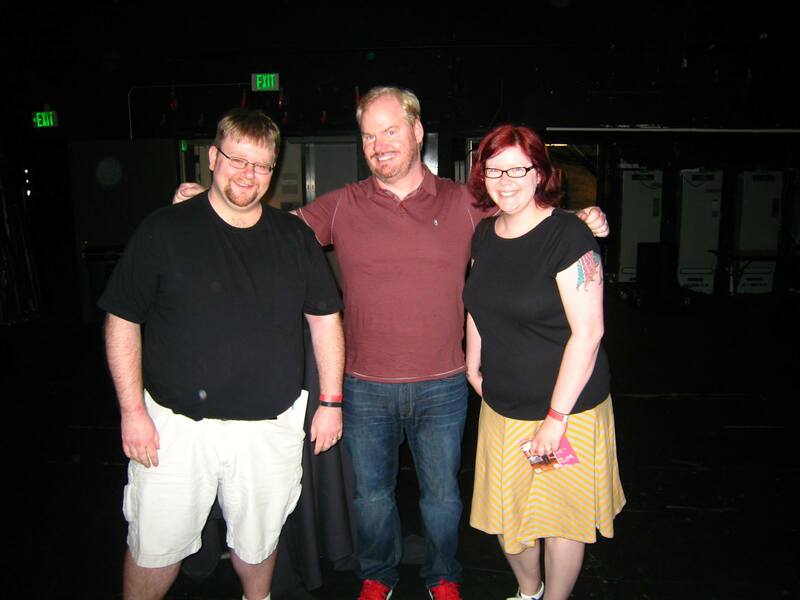 Jim was at the Paramount back in July and we had front-row seats and got to meet him after the show. In case you weren’t aware, his persona centers on the fact that he is very pale. One of my favorite albums is Beyond the Pale, and he co-starred with Conan O’Brien in an animated short series called Pale Force, where their paleness is over-exaggerated for comedic effect. 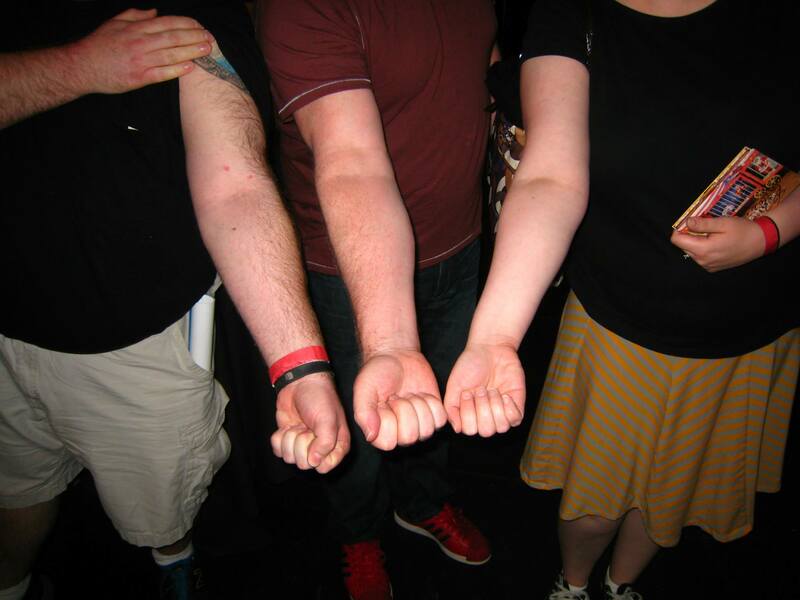 That paleness is also the source of their superpowers. Well we did a visual recount and I think you’ll agree that I am actually the victor. And to the victor, goes the sunscreen. He then asked to take a photo with our faces so we could remember who the palest was. I didn’t solve any of my problems that night, but I did have a great experience and an amazing time with my husband. We made some memories and laughed until we cried. That kind of emotional release can, I propose, be even more helpful than reading a detailed book about how to organize your life, or lose weight. And let’s be honest: it takes much less time to watch or listen to stand-up than it would take to read the latest self-help tome. But you don’t have to take my word for it. Try some of the comedy your library has to offer. I suggest the following: take two stand-up routines and call me in the morning. This entry was posted in Book Discussions & Events, Humor, Nonfiction and tagged comedy, Jim Gaffigan, self-help, stand-up by Carol. Bookmark the permalink. Thanks, Marge! I found your presentation and the group discussing to be inspiring!